To promote fast and sustainable economic growth, efforts should be devoted to further improving the business climate and economic competitiveness, reforming specialized inspections of imports and exports and cutting business conditions. This is highlighted in Resolution 01/NQ-CP inked by Prime Minister Nguyen Xuan Phuc on the first day of 2018, which outlines the tasks and solutions for implementing the socio-economic development plan in the year. The resolution sets the targets of achieving an economic growth of 6.7 percent, maintaining macroeconomic stability, and gearing up the process of economic restructuring and growth model change toward sustainable development. It identifies nearly 250 specific tasks for ministries, sectors and localities to perform according to specific objectives, roadmaps and deadlines. The resolution states that the Government will concentrate on reforming administrative formalities related to land, tax, customs, agriculture, information technology application, startup, tourism, credit access and social insurance, aiming to slash time and costs for people and businesses. The Government will further amend regulations on business and investment conditions. In 2018, government leaders will continue to hold regular dialogues with businesses to hear and promptly settle their petitions. Efforts will be made to drastically improve indicators of the business climate and competitiveness of the economy in order to lift Vietnam to the top ASEAN-4 countries in terms of competitiveness and business climate by the end of this year, the resolution says. According to Minister of Justice Le Thanh Long, there are now approximately 4,284 business and investment conditions applicable to 243 conditional business lines. Yet, regulations on business conditions change frequently so it is hard to have an accurate count of them. He said there is even a business line regulated by different decrees as it falls under the management scope of many ministries and sectors. That business line is food trading, he said, which is placed under the management of three ministries: Industry and Trade, Agriculture and Rural Development, and Health, and regulated by the Law on Food Safety and four governmental decrees, namely Decree 38 of 2012, and Decrees 66, 67 and 77 of 2016. It is assessed that there remain many irrational business and investment conditions that restrict market access and hamper the competitiveness and labor productivity of businesses. They also create loopholes for negative practices to occur. Therefore, ministries and sectors need to further abolish these conditions while ensuring state management requirements, especially for special business lines. According to the Ministry of Justice, since July 1, 2015, the effective date of the 2014 Law on Investment, it has detected 31 documents that contain inappropriate provisions concerning investment and business conditions, including six found in 2017 alone. So far, 26 out of these 31 documents have been revised or cancelled by related ministries, sectors and localities. Reforming the regulations on business conditions to boost competition and development of businesses has been considered a key task of the Government in recent years. In the Government’s meeting with local leaders held last December, the Prime Minister asked ministries to review and eliminate at least one-third to half of existing business conditions and administrative formalities that are causing obstacles and difficulties to investment and business activities. According to the Ministry of Planning and Investment, by the end of last year, it received reports from only five ministries on their reviews of investment and business conditions under their management and elimination plans. The Ministry of Industry and Trade is the first in proposing the elimination of 675 out of 1,216 investment and business conditions (accounting for 55 percent). On January 15, the Prime Minister issued Decree 08 to approve the ministry’s proposals, cutting the above number of business conditions in eight fields: petrol and oil, tobacco, electricity, commercial franchise, e-commerce, chemicals, industrial explosives, and food trading. Meanwhile, out of total 345 business conditions under its management, the Ministry of Agriculture and Rural Development proposed cutting 65 and modifying 53, accounting for 34.2 percent. Yet, the ministry has not yet come up with any specific plan for such reduction. The Ministry of Construction proposed removing four business lines from the list of conditional business lines for lack of the criteria specified in Article 7 of the Law on Investment. The ministry also suggested abolishing 89 conditions (accounting for 41.3 percent), simplifying 94 conditions (43.7 percent), and retaining 32 conditions (15 percent) out of total 215 investment and business conditions under its management. These proposals will be incorporated into a draft law revising the Construction Law, Housing Law, Law on Real Estate Business and Law on Urban Planning, and in a draft decree amending, supplementing and cancelling a number of provisions on investment and business conditions managed by the Ministry of Construction. These drafts are slated to be presented to the Government this month. The Ministry of Information and Communications also completed the review and proposed to trim 51 conditions (16 percent) but not yet produced a specific plan for its proposal. Particularly, the State Bank of Vietnam will retain all existing business conditions in the banking sector due to the peculiarities of credit institutions compared to other types of business and the high risks of banking operations. While expecting to receive similar reports from other ministries, Minister of Planning and Investment Nguyen Chi Dung said the review results revealed that ministries are still confused between business conditions applicable to business lines and specialized management of products and goods. So far, many conditions on specialized management of products and goods have been imposed as business conditions. General conditions, such as business registration certificates; fire prevention and fighting requirements; environment; and occupational safety), which are managed by such agencies as planning and investment, public security, natural resources and environment, and labor, war invalids and social affairs, are still imposed by other agencies. There remain many business conditions which are unnecessary, unclear and unspecific. Some revisions are merely re-wording, not bringing about changes truly favorable for businesses. At the Government’s meeting with local authorities, representatives of some businesses said the simplification of many administrative procedures was just formalistic. Talking to Lao Dong (Labor) newspaper, Do Duy Hung, Director of Vietnam HiNet Technology JSC in Hanoi, said the reduction of business registration procedures and conditions has given more autonomy to businesses in production and business activities. A specific example is the grant of business registration certificates without writing information on business sectors, which allows businesses to carry out any production and business activities not banned by law. However, he said, the elimination of many administrative procedures was formalistic, such as the online bill payment, which many businesses have so far not applied. 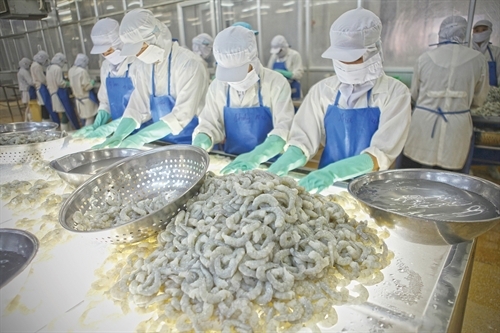 Phan Tien Dung, a representative of Thao Nguyen Breed JSC in Phu Yen province, said the biggest difficulty now for businesses was the licensing procedures through multiple agencies from commune to provincial levels. Taking bank loans remained a big problem for startups as they are required to have collateral and not allowed to mortgage their projects and project land. “In order to create conditions for businesses, the Government needs to eliminate more administrative procedures, especially sub-licenses,” he said. At a recent cabinet meeting on lawmaking work, Director of the Central Institute for Economic Management Nguyen Dinh Cung said that regulations on conditional business sectors and business conditions pose a burning issue in the legal system on business in general and business environment in particular. He asked the Prime Minister to eliminate nearly 3,000 business conditions.